We've been gone. Again! But we're back. Much to write about and reflect upon. Much laundry. Much to celebrate now that my kids are in camp for the next two weeks. I'm pretty much done with summer folks. Need me some Autumn. Last weekend we went camping with a family that once lived close enough that we could get together on weekends for trips and hikes and adventures but then they abandoned us for the east coast so now we hate them. 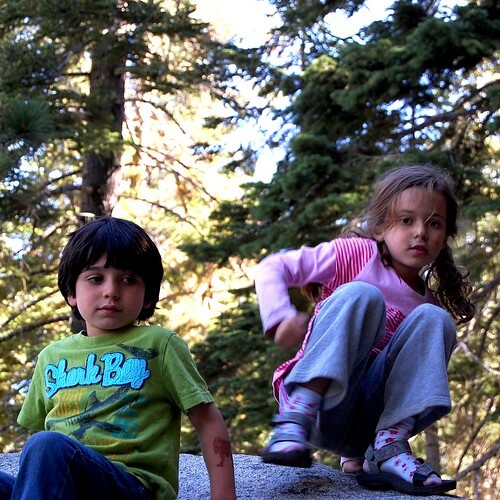 But they came for a visit and we had a great time camping in Bear Valley which is out in the Sierras. Our kids are about the same age. In fact our son and their oldest daughter are only five days apart and even though we never lived close enough to their family for the kids to be best friends in the whole wide world, they are fairly close and they recognize they have a special childhood bond. So they had fun reuniting. And we had fun watching them and planning their wedding. And incidentally the day before we saw them I did a little video and photo shoot for Shutterfly talking about a photo book I had made for this same family as a going away present almost two years ago. I went to a fancy hotel and a real make up artist did what she could to make me look awake and for two hours I told them all about the book and our friendship and the kids and our upcoming reunion (and a bunch of other books I have made). And they paid me! Suckers. They thought that since they know me from work (I used to work there) that I'd be as charming and intelligible on camera as I am in real life. Little did they know that I am even less photogenic than 95% of the rest of the world by my last count and that in front of a camera I mumble and twitch and sometimes pick my nose unconsciously.